Homeless people have half the life expectancy in comparison to other BC residents and their lives are now at risk more than ever. Yet, Horgan and Clark have remained virtually silent on the homelessness crisis. The Carnegie Community Action Project (CCAP) is calling on John Horgan and Christy Clark to visit the Ten Year Tent City at 950 Main Street in Vancouver. 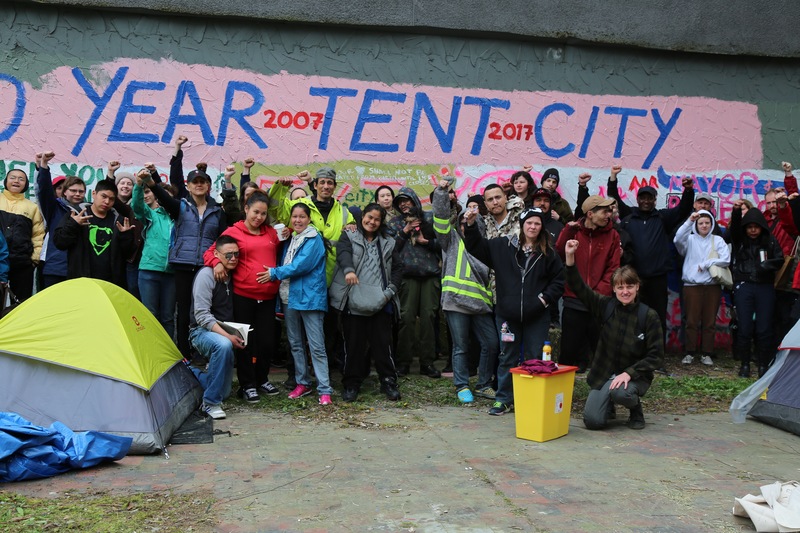 On Friday, April 28, a group of homeless people and supporters established a new tent city led by women. Organizers are calling it the “Ten Year Tent City” to mark the ten year anniversary of the 2007 tent city that took place in the very same city-owned lot. Despite promises for social housing, the lot at 950 Main Street has remained empty for the past decade while the homelessness crisis intensifies and more lives are lost. Sarah B, a 21-year-old pregnant woman staying at the Ten Year Tent City was evicted from the Brandiz hotel, an SRO in Vancouver’s Downtown Eastside. The transitional housing that has been offered to her, most being for women only, would prevent her boyfriend from staying with her. “They need to build more housing for families, where I can be with my kid and boyfriend together,” said Sarah. 3605 homeless people were counted in March in Metro Vancouver, an increase of 30% over last year’s homeless count. In Vancouver, shelters can only accommodate less than half of people who are homeless. With nowhere to go, many are pushed onto the streets but are forced to move each day by police and City workers. The NDP and Liberals have failed to adequately address the homelessness crisis. The NDP’s 2017 election platform to end homelessness is not clear while the Liberal party’s election platform does not address homelessness at all. Do we want a province where homelessness continues to grow and homeless people continue to die young? With only a few days left until the provincial election, CCAP challenges Horgan and Clark to visit the Ten Year Tent City and disclose how they plan to end homelessness. Bring in real rent control based on the unit, not the tenant.